Our family weekend in the Derbyshire Dales was an action packed one night weekend with a week’s worth of activities crammed in. Can you believe that in just two days we cycled on the High Peak and the Tissington Trail, visited the dramatic Arbor Low stones, played on Derbyshire’s best village play ground, slept in a converted THE RECKONING HOUSE, discovered a lost river under Lathkill Dale, lunched at Uncle Geoff’s tearooms and visited to the Heights of Abraham by Cable Car? Well we did and if you want to do it too – here’s how to Do-It -Yourself! There were ten of us in total, with 10 bikes and two cars, and the first trick was to get one car delivered to The Reckoning House camping barn packed with all our goodies for an enjoyable evening and comfy night. We met up at the Minninglow car park on the High Peak Trail, but if you fancy a longer ride you could start closer to Cromford Junction. Start at the junction itself if you enjoy lots of uphill pushing or Middletop Top for a flat ride with only one gradual incline. The High Peak Trail, on old railway line, provides easy riding, ideal for families, with no hills, no cars and panoramic views of the Derbyshire Dales. Our two cars dropped off 8 bikes with their riders at Minninglow and drove to the Reckoning House, then both drivers (with their bikes) jumped into one car and drove to Parsley Hay, an old station on the Tissington trail. Here the drivers got on their bikes and headed off along the Tissington Trail towards the junction with the High Peak Trail (see map here). Meanwhile the 8 cyclists were coming along the High Peak Trail towards the Tissington Trail and inevitably the 10 cyclists become one group once more and rode off in the direction of Parsley Hay. 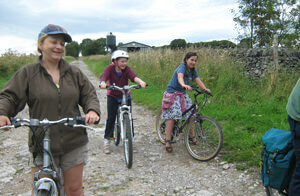 Cycling on the High Peak Trail in the Derbyshire Dales. At Parsley Hay we ignored the café and ice creams (with difficultly!) and then left the trail, crossing the busy A515 Roman road to join the quite country lanes towards Monyash. A slight diversion with a 5 min uphill climb took us to the foot path which allows access to the stunning Arbor Low stone circle perched on an upland overlooking the Derbyshire Dales. Here we had our picnic under a stormy sky watching the rain fall on the hill around us. Maybe the gods of the stones kept the rain away from our picnic spot as we sat on the central stone watching the rain lashing down on the landscape around us. From Arbor Low it was a two mile long exhilarating decent into Monyash and we whooshed our way down invigorated by the speed, into the heart of the village. Monyash has a great pub, The Bulls Head, with a welcoming atmosphere, nice food and the kids most recommended village playground in Derbyshire on its doorstep. After a fortifying pint we extracted the kids from the zip wire, swing boats and slides, and got back on our bikes for the 2 miles back route to the Reckoning House Camp Barn. I was given this tip-off by Mrs Finney, the owner of the Camping Barn, who said the main road got busy on Sunday (not ideal with a pack of 10 bikes and 6 children) and emailed us a route which was a little further but so much nicer. From the centre of Monyash we turned up Chapel Street and took the first right fork along Horse Lane. A little further on the next turn was available and we took this, passing Magpie Mine. Soon after the mine we took a sharp right down a rough track on the right (Green Lane). This bumpy short track brought us out on the main road exactly opposite to the road down to Hadden Grove and the camping barn, deep in the Derbyshire Dales. The Reckoning House in the Derbyshire Dales. The Reckoning House was just as it looked in the Independent Hostel Guide, a cosy cottage with a courtyard bordered by a low stone wall and surrounded by a field. It was here that lead ore payments were once reckoned and paid out to the miners. The courtyard turned out to be a suntrap still glowing with the day’s warmth and we opened the doors of the barn wide, cooked our dinner and drank Pimms while the children laid out their sleeping bags and teddies on the bunks. We ended the night with some hysterical games of Monopoly Deal, a fun-filled card game, and all fell into our bunks for a welcome night’s sleep in the Derbyshire Dales. The morning started with porridge and showers, slowly for some and fast for others, as half of our group hurried away to do a day’s work. One person grabbed a lift with the workers to fetch the second car from Parsley Hay and on the way they dropped a bike at Over Haddon. After much chatting and tea drinking we were ready to leave the Reckoning House. Stuffing our goodies back into the car we walked away from the camping barn and took an old millcart track which dropped into the scenic valley of Lathkill Dale. Its difficult to believe that this secretive dale is only 10 minutes’ walk from Haddon Grove. At the valley bottom along the fast flowing river (which sometimes disappears completely in dry weather) we found a riverside trail reclaimed by nature but with signs showing it was once a broad track supplying perhaps the mill or mines. The track had a sign giving right of access to all except on one day a year, which makes me want to go back on Easter Sunday and see if anyone collects the toll. Lathkill Dale was wild but as we wandered down we came across the ruins of a substantial house, strangely out of place, with semi circular door steps leading up to a wide entrance. A Natural England sign announced this as Batemans House, built to hide/guard up-to-the-minute mining machinery, in the early 1800s. 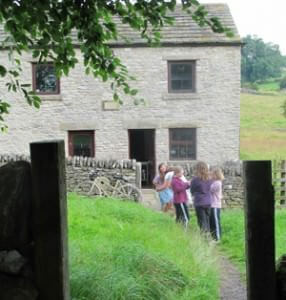 The house had a shaft fitted with a water pump (the first of its kind in the Derbyshire Dales) which used the power of the flowing river above ground to pump under ground water from the mines. There was an access ladder which we climbed down to see, flowing under the house itself, a torrential underground river. The signs said that a mine manger lived at Batemans House with his family and there is a rumor that his wife, too enthusiastic with her cleaning, once put her broom though the floor and into the shaft below. Strange to think of all this industry in such a wild and beautiful valley, but once looked for we could see shapes all around which would have been bridges, aqueducts, tracks and mines, now all shrouded and smothered by greenery. Lathkill Ruins in the Derbyshire Dales. We left Lathkill Dale close to Over Haddon and climbed up the valley side to have egg and chips at Uncle Geoff’s café. Geoff has been running this quirky informal café in his retirement for many years, and while we sat with him we found out that he had laid the flag stones in the Reckoning House courtyard where we had enjoyed the stored day’s warmth the night before. Here’s where the bike drop that morning came in handy as our one of our party cycled the two flat miles to the Reckoning House at Haddon Grove collected the car and came back for the rest of us. Well-fed we set out by car to our afternoon activity in the inland seaside village of Matlock Bath in the Derbyshire Dales, famed for its fish and chips and Motorbikes. We had spotted the cable cars on our journey to the High Peak Trail the day before (was that really only a day ago?) and had decided that night to make the cable cars, caves and hilltop park of the Heights of Abraham our tourist destination highlight of this Derbyshire Dales mini break. We were even more curious because we had heard that the Olympic Torch had gone up the cable cars only a few weeks before. Parking in Matlock Bath we took the cable car right up the steep sides of the gorge, great views, but no signs of scorch marks on the cable car! At the top were even better views, great playgrounds and a café. We watched a Punch and Judy Show and then took a cave tour where we found out lots about the old lead miners and how they made a living out of the tourists. Really relevant when you think we’d been sleeping in a minors Reckoning House the night before! A long time in the gift shops and a cup of tea at the café and we were ready for home. Having started on bikes and ended up on cable cars all in the Derbyshire Dales this was certainly a weekend to remember. You can explore all the Peak District cycle trails on the White Peak Loop in Derbyshire, with accommodation in bunkhouses this makes an excellent easy cycling holiday.